Please be patient with us as we update our website to reflect our recent changes. 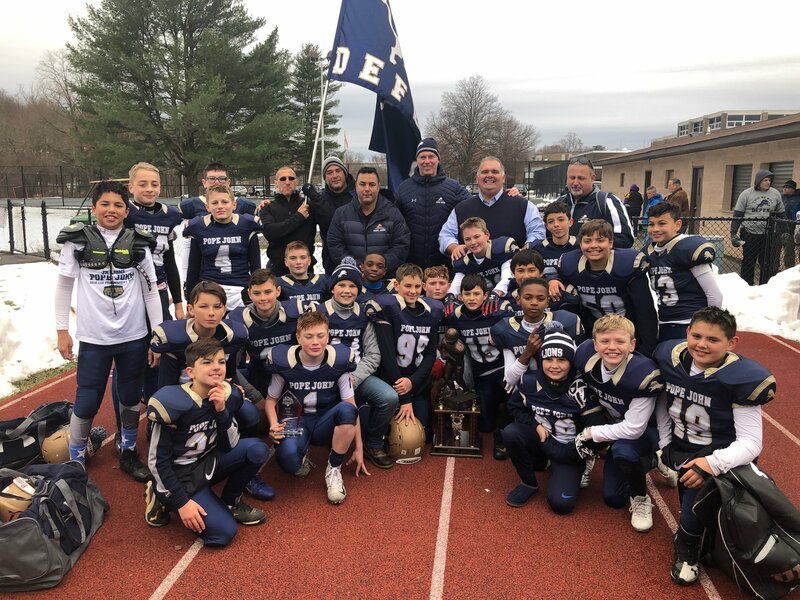 The Greater New Jersey AYF (GNJAYF) is an unlimited weight, high-school aligned, intermediate level football league founded on the principles of being an extension of the local High School program. We work in partnership our High School coaches and use the same techniques, terminology, schemes and concepts used by the High School programs so our players are best prepared for the next step in their football career. For this reason, the GNJ requires that all players play on teams aligned to where their primary residence is. as AYF BIG EAST REGIONAL 11U CHAMPIONS. what you've all accomplished so far! Congratulations to our 2018 Greater NJ AYF 8th Grade All-Stars! 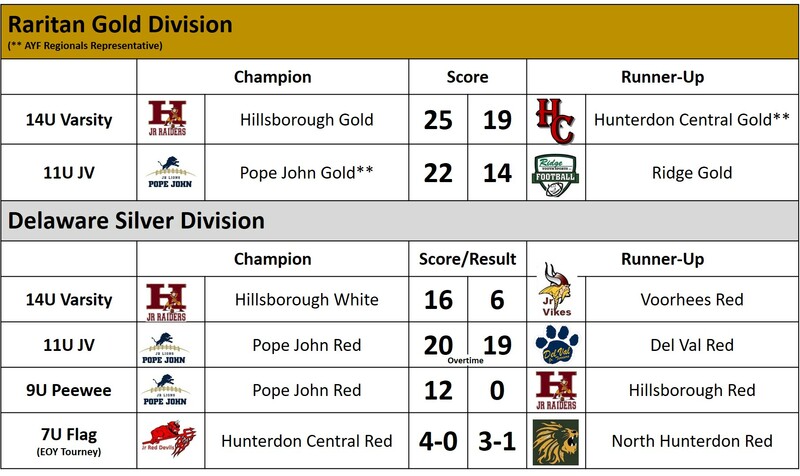 Out Top Tier Divison Raritan has playoffs starting October 27th and Delaware Divison starts playoffs on 11/3 with our Raritan Gold Conference Finals on 11/3 and Delaware Championship & 8th Grade All-Star Day is November 10th and is being Hosted at North Hunterdon High School. playing on 15 different home fields. We would like to share an exciting new step that the Jr Skyland Football Conference (“JSFC”) will be taking in 2018. We are an unlimited weight, high-school aligned, intermediate level football league founded as an extension of the local High School program. It is our league’s objective work in partnership with their respective high school coaches and use the same teaching techniques, terminology, and fundamental concepts used by the high school programs so our young student-athletes are best prepared for the next step in their football career. For this reason, we require that all players play on teams aligned to where their primary residence is and/or for the program of the high school that they attend. Additionally, we strive to ensure that teams are playing opponents of comparable talent depth and skill level. We require all of our coaches to be USA Football safety certified. We were early adopters and have been partnering with USA Football and their safety programs going back 7+ years. This vision and these goals are important to all of our member programs. As we evaluate the external pressures we all are experiencing related to the perception of football, and in order to best position ourselves to achieve our goals listed above, we have decided that our conference as a whole will align itself the American Youth Football (AYF) starting with the 2018 fall football season. In the near & long term – provides a conference for other, existing AYF programs in our region an opportunity to realign to our conference and play more locally; as well as improve our ability to attract additional programs to our conference based on the platform AYF offers. The partnership between our youth programs and their high school programs is paramount to what we have built here and what we continue to build upon. We will continue to reach out to work hand in hand with our affliated High School distrcits as partners to energize those communities around youth football, provide a place where players of all levels, skills amd abilities can enjoy and learn valuable life lessons from the game of football, assist in any multi-program challenges and ensure we are preparing those players who what a career beyond youth football to be as ready as possible for their high school programs. Be committed to teaching safe football and ensuring coaches at all levels and across all teams are contonuosly learning and improving to ensure a safe, fun and positive football experience. Put GNJ first! We do not want programs who have split aliegences and aren't priortizing GNJAYF.